From disappearing jobs to new skills, the robot revolution has many faces. High-speed mobile internet, artificial intelligence, big data analytics, and cloud technology are set to spearhead companies’ adoption of new technologies between 2018 and 2022. Many will also look to machine learning and augmented and virtual reality for considerable business investment. By contrast, investment in the kind of robotic technologies imagined in movies and popular fiction will remain somewhat more niche over the period – but is nevertheless picking up pace. 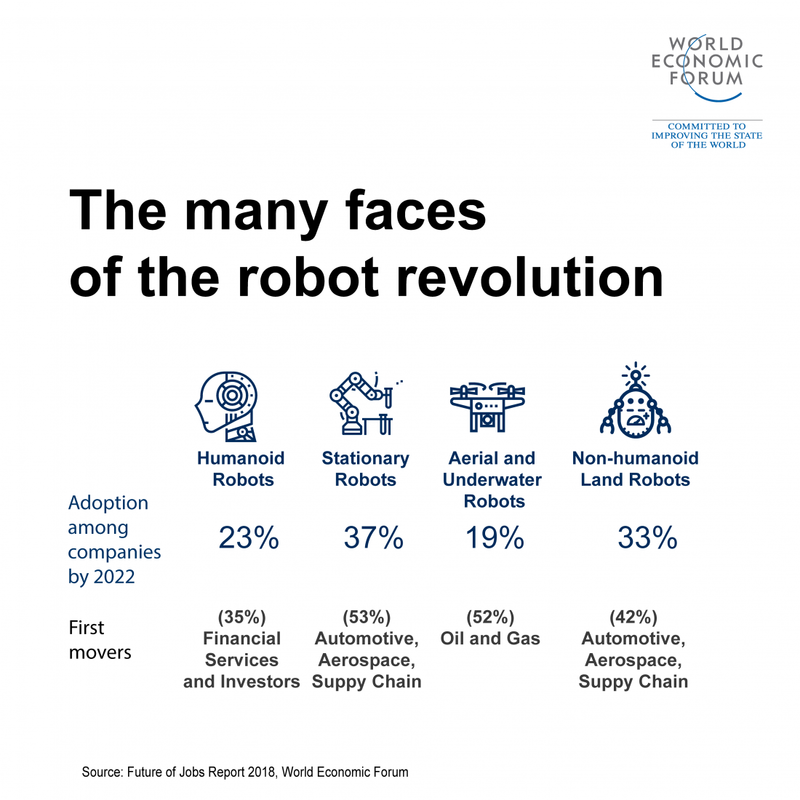 Stationary robots are likely to be the most widely adopted by 2022 – but different industries have distinct use cases and preferences. 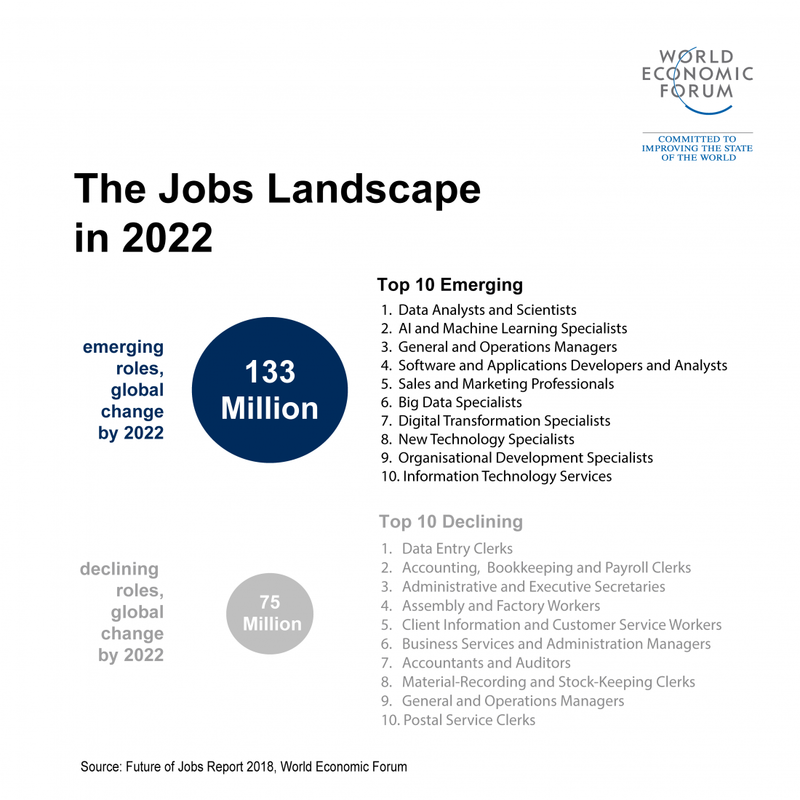 By 2022, today’s newly emerging occupations are set to grow from 16% to 27% of the employee base of large firms globally, while job roles currently affected by technological obsolescence are set to decrease from 31% to 21%. In purely quantitative terms, 75 million current job roles may be displaced by the shift in the division of labour between humans, machines and algorithms, while 133 million new job roles may emerge at the same time. Growing occupations include roles such as Data Analysts, Software and Applications Developers and E-commerce and Social Media Specialists – jobs that are significantly based on, and enhanced by, the use of technology. However, also expected to grow are job roles based on distinctively ‘human' traits, such as Customer Service Workers, Sales and Marketing Professionals, Training and Development, People and Culture, and Organizational Development Specialists as well as Innovation Managers. Employers anticipate a significant shift in the division of labour between humans, machines and algorithms for the tasks of today. Currently an average of 71% of total task hours across the industries covered by our Future of Jobs Report are performed by humans, compared to 29% by machines or algorithms. 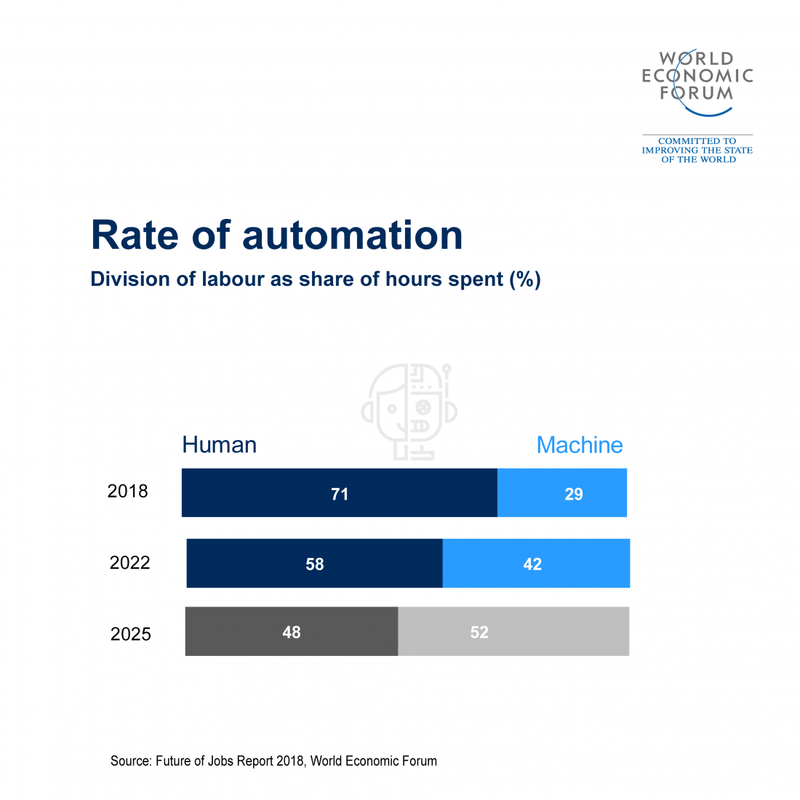 By 2022 this average is expected to have shifted to 58% task hours performed by humans, and 42% by machines or algorithms. In terms of total working hours, no work task is yet performed predominantly by machines or algorithms today. By 2022, 62% of organization’s data processing and information search and transmission tasks will be performed by machines. Relative to their starting point today, the expansion of machines’ share of work task performance will be particularly marked in reasoning and decision-making, administrative and information search tasks. Even work tasks overwhelmingly performed by humans today — communicating, interacting, coordinating, managing and advising — will begin to be taken on by machines, although to a lesser degree. 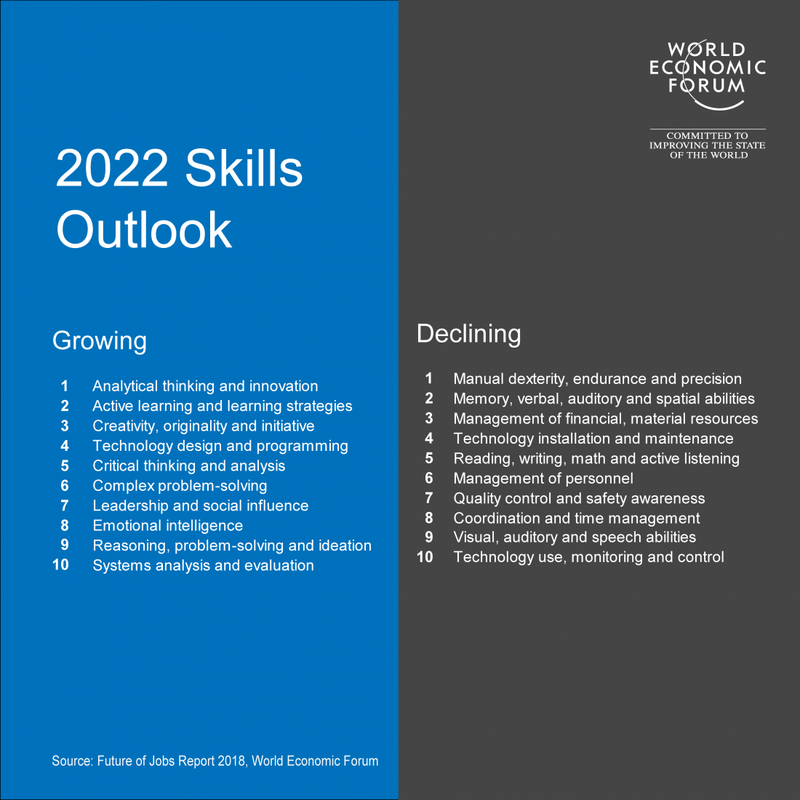 By 2022 the skills required to perform most jobs will have shifted significantly. Global average “skills stability”— the proportion of core skills required to perform a job that will remain the same — is expected to be about 58%. That means workers will see an average shift of 42% in required workplace skills in the period leading up to 2022. Skills growing in prominence include analytical thinking and active learning as well as skills such as technology design, highlighting the growing demand for various forms of technology competency. However, proficiency in new technologies is only one part of the 2022 skills equation. “Human” skills such as creativity, originality and initiative, critical thinking, persuasion and negotiation will likewise retain or increase their value, as will attention to detail, resilience, flexibility and complex problem-solving. Emotional intelligence, leadership and social influence as well as service orientation are also set to see particular increase in demand relative to their current prominence today. 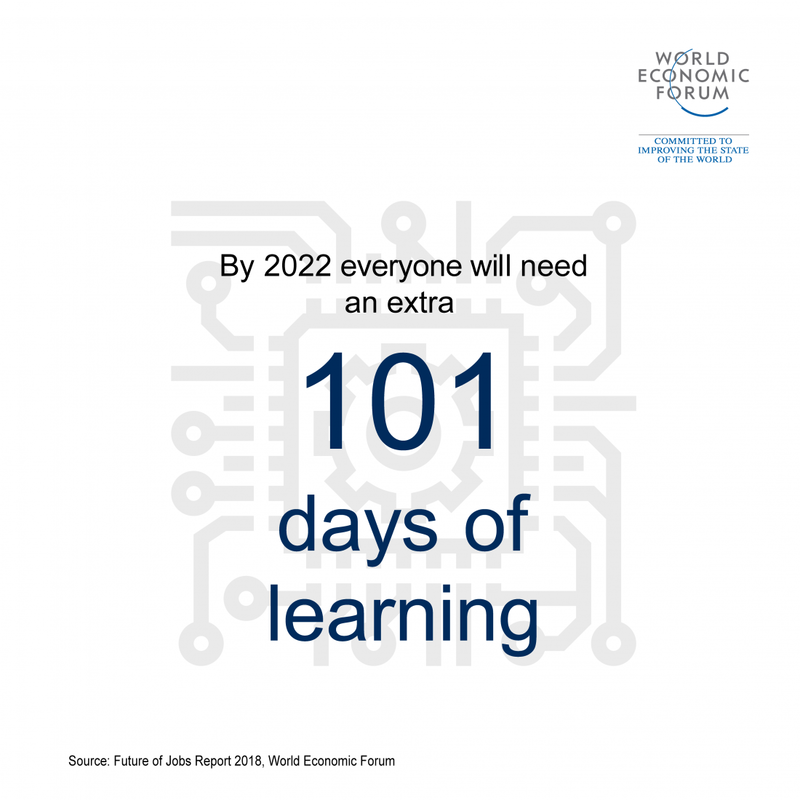 On average, employees will need 101 days of retraining and upskilling in the period up to 2022. Emerging skills gaps — both among individual workers and among companies’ senior leadership — may significantly obstruct organization’s transformation management. Depending on industry and geography, between one-half and two-thirds of companies are likely to turn to external contractors, temporary staff and freelancers to address their skills gaps. A comprehensive approach to workforce planning, reskilling and upskilling will be the key for positive, proactive management of such trends. Till Alexander Leopold and Vesselina Ratcheva are Project Leads in the World Economic Forum’s Centre for the New Economy and Society.